Born and raised on the prairies of southwest Louisiana, Steve Cormier was aware of his Cajun heritage at an early age, but the history of that heritage did not spark his interest until later in life. The oldest of the four children of Curtis P. and Eva Miller Cormier of Jennings, he graduated from Jennings High School in 1967 and received a B.A. degree in social studies education from McNeese State University, Lake Charles, in December 1972. Fulfilling his ROTC obligation, he served two years on active duty as an Army Quartermaster Corps second lieutenant in Virginia and Colorado. Returning to Virginia, he received an M.A. degree in history from Old Dominion University, Norfolk, in December 1982 while teaching social studies at Lloyd C. Bird High School in Chesterfield County, south of Richmond. His masters thesis, “Forgotten Campaign: The Siege of Suffolk, April 19-May 4, 1863,” was published by H.E. Howard, Inc., of Lynchburg as part of its Virginia Civil War Battles and Leaders Series in October 1989. After 30 years in the classroom, he retired from teaching in July 2007 to research and write history full time. 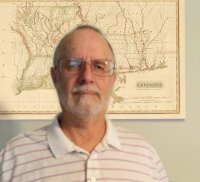 An abiding interest in the War of 1861, coupled with a budding interest in family genealogy, led him to contemplate a history of Cajun units who fought for the Southern Confederacy. This, in turn, led him to the question: who are the Cajuns of South Louisiana? To answer this question, he created a website, www.acadiansingray.com, in July 2000. Over the years, Acadians in Gray evolved from a military study of the Cajuns in the Southern Confederacy to a history of the Acadian exiles in Louisiana and their Cajun descendants. The most integral part of the website, “The Acadians of Louisiana: a Synthesis,” attempts to incorporate family genealogy into narrative history. Significantly, the “Synthesis,” a multi-volume study, is being written online, allowing anyone interested in the Cajun people to follow the evolution of an historical work from research to publishable form. Comeaux lives in Prince George County, Virginia, with his wife Sandi, an accomplished artist. His son Michael is an historical interpreter for the city of Petersburg.